Just because someone has Alzheimer’s disease does not mean they are now supposed to be confined to their homes. It is important that they continue to do activities they loved while they are still independently able to do so. 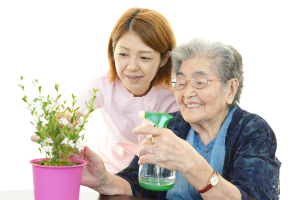 Some activities may require the elder to get assistance from an elderly home care provider, while others may be simple enough for them to do alone. Since many people with Alzheimer’s disease ends up withdrawing themselves from social events, these activities can be comfortably done alone, with a family member, or with an elder home care professional. Become crafty. Whether or not your loved one has ever knitted or done a craft is irrelevant. Now is the time to begin learning a new skill. It can also provide relaxation, especially during stressful times. Listen to music. Is there a song or type of music that the elder enjoys? Or do they know how to play the piano or another musical instrument? If music brings the elder joy, play it often. Organize the home. If organizing and cleaning is your loved one’s thing, then encourage them to organize a home office or other room in the house. Cleaning the home by folding laundry, sweeping, vacuuming, and cleaning the windows may also be enjoyable to the elder because it will give them a sense of accomplishment and self-worth. Take care of the garden. Making the garden look beautiful by giving it a little TLC may be just what your loved one needs, too. They may also enjoy visiting all of the beautiful and colorful flowers at a botanical garden. Do a puzzle. Jigsaw and crossword puzzles are excellent ways to get the brain working. Encourage them to complete these puzzles in order to stimulate their mind. Watch home videos. Bond over find memories from the past by watching home videos. It will give you a chance to reminisce over what is taking place in each video, as well as who is in the videos. Cook together. Does your loved one have a favorite recipe or one that has been in the family for many generations? Cook it together, while your parent shares memories they have had making this recipe in the past. Read the newspaper. Stay up-to date on what is going on in the world and community by reading the newspaper. If the senior is unable to read it themselves, read it to them. This entry was posted in Home Care Covington TN and tagged Home Care Covington TN. Bookmark the permalink.